I’ve not really visited many Chinese restaurants since I moved to Bristol, and the plan is for 2012 to be the year where I try out more of the places that have been recommended to me. Dynasty, on St Thomas Street, is a place that has always been talked about favourably by people I know, and the restaurant’s high ranking in a feature that I pulled together for the This Is Bristol website made me quite excited about my visit for a dim sum lunch the following week. Unassumingly nestled in a quiet corner off Victoria Street, you’d be forgiven for thinking that the restaurant is pretty small. Opening up into a lobby area with a water feature, the hustle and bustle of the restaurant doesn’t hit you until you head up the stairs to the dining room. We visited shortly after the Chinese New Year celebration period, and so the large dining room was still festooned with paper lanterns and decorative envelopes. 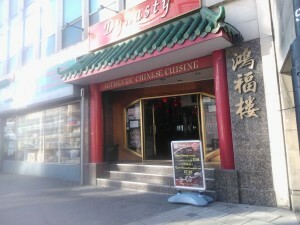 A dining venue of choice for the corporate market, and with its function room proving popular for events such as Chinese banquets and wedding parties, Dynasty offers its customers fine dining, Chinese-style. 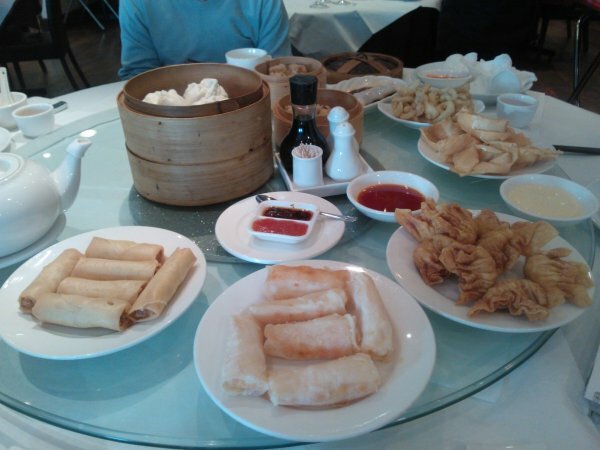 While the evenings allow the choice from the standard a la carte menu (with Cantonese, Szechuan and Peking cuisines all featured), lunchtimes bring the addition of Dynasty’s extensive dim sum menu, and it was from this selection that we dined on this occasion. With around 80 dishes to choose from, ranging from £2.60 to £5, you’ll be spoilt for choice. Alongside the more basic options such as deep fried wan ton (£2.90) and shredded chicken spring rolls (£2.60), the more adventurous can go for dishes including snails in curry sauce (£2.60) and steamed intestines in black pepper sauce (£2.90). Our recommendations would have to include the char siu pork buns (£2.60) – steaming balls of fluffy white dough wrapped around sweet and sticky chunks of slow roasted char siu pork. The yam croquettes with minced meat (£2.60) were also a favourite, and the barbecued pork cheung fun (£2.90), best described as cannelloni, Chinese-style, were also well-received. We couldn’t fault the meal, really…our fried prawn dumplings (£3.20) and deep fried wan ton were perfectly crisp and crunchy, the steamed dumplings beautifully moist and full of flavour, and the deep fried squid (£3.20) were succulent and not at all chewy, as they sometimes have the tendency to be. Ours was a fairly vegetable-free meal, but vegetarians are also catered for, with dishes such as beancurd wrap in oyster sauce (£3.00), monk’s vegetables cheung fun (£2.90) and the Dynasty beancurd pastry (£3.20) all appearing on the menu.